One Evening in the Biergarten, originally uploaded by Werner Kunz (werkunz1). Bamberg is a lovely small German Town with a lot of young students, small houses, and old churches. 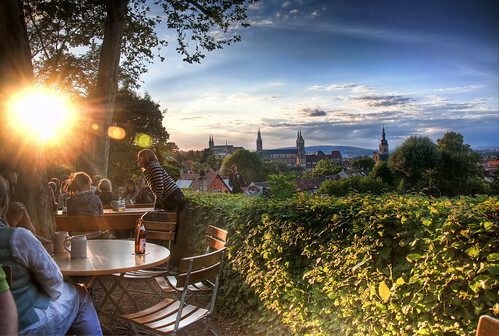 On a summer evening we went up to a nice Biergarten on a Hill. It was nice weather and a great atmosphere. I hope you can feel it a bit. This sun glare rules. It adds so much feeling to the image. This looks like it's straight out of a magazine. Once again, HDR.Ha and I just realized that car HDR picture I commented on earlier today. Then I came looking at your photography.